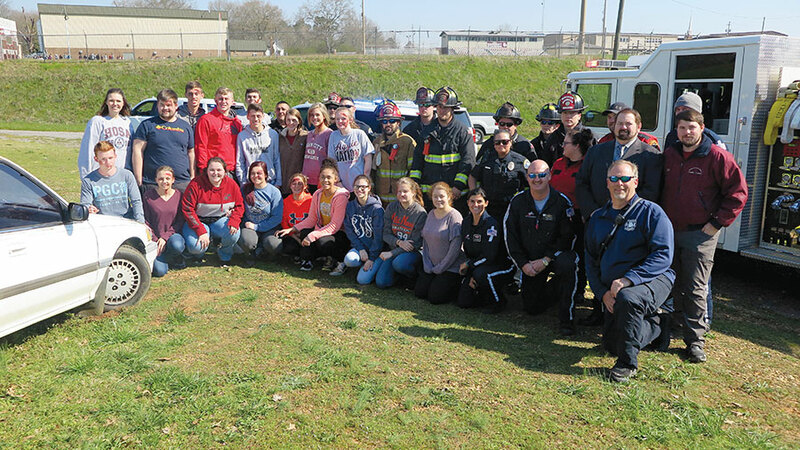 Students, faculty and members of the local police, fire, air evac and emergency paramedic departments are shown gathered together after the Third Annual HOSA Prom Promise Mock Wreck on Wednesday, March 20, at Hamilton High School. HAMILTON - Hamilton High School students conducted the Third Annual Health Occupations Students of America (HOSA) Prom Promise mock wreck on Wednesday, March 20, in which students performed a mock car wreck to provide a sobering reminder for students to make good decisions during the night of prom, Friday, March 22, at Hamilton High. During the event, which was held in an area adjacent to the Hamilton Walking Track, students from Hamilton High acted out a mock car wreck with help from the Hamilton Police Department, Hamilton Fire Department, Marion County 9-1-1, Regional Paramedical Services Ambulance, Air Evac Lifeteam, Hamilton Funeral Home and Dwight Lamb Premier Wrecker Service. Throughout the mock wreck, local departments simulated how they would conduct themselves in a real-life situation of a car wreck.